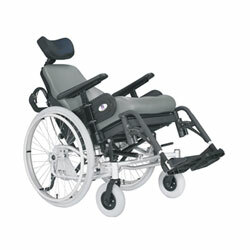 FRONT CASTER (WHEEL): 8" x 2"
An Aluminum-based wheelchair features manually-operated tilting and reclining functions. The tilting and reclining angles can reach as far as 30°. Also the ergonomic seating system is highlighted with the extendable, height-adjustable and detachable armrests in addition to the height-adjustable backrest and push-bars. The rear wheels are available in 24" (quick-release ones)and the seat width options are 16", 18", 22"